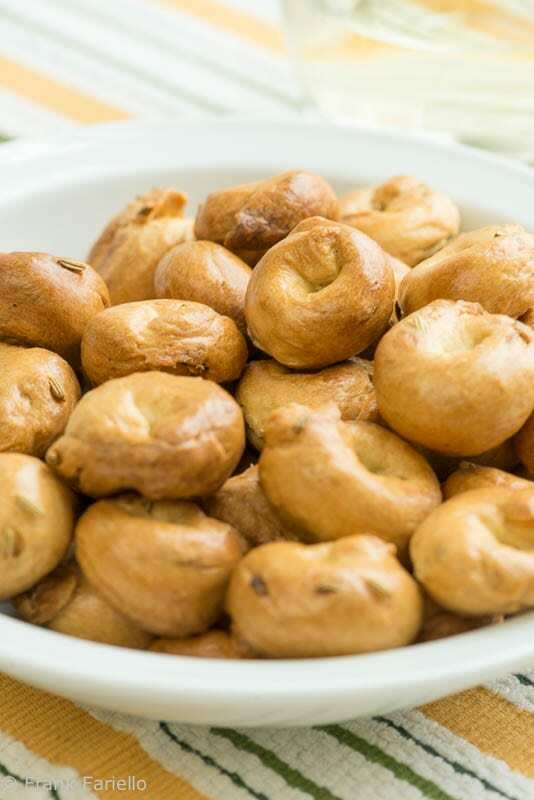 It is said that the three pillars of Puglia’s agriculture are wheat, wine and olives, and all three make their way into this simple but tasty Puglian snack. Flour, white wine and olive oil are mixed to make a simple dough, formed into rings and, much like bagels, briefly simmered and then baked until golden brown. If this doesn’t sound like much, wait until you try it! At its simplest, the dough is seasoned just with a generous pinch or two or salt, but you can make taralli with various flavorings, the most common being fennel seeds or (my personal favorite) cracked black pepper. Mix all the ingredients together in a bowl, including the optional ingredients if using, until you have a firm but pliable dough. Knead the dough for a good 15-20 minute if by hand. You can also use a standard mixer with the paddle attached and set to the lowest speed for 5-10 minutes. Let the kneaded dough rest, covered with a towel or plastic wrap, for at least 30 minutes. After the rest, form the taralli by taking a walnut-sized piece of dough, rolling it out with the palm of your hand into a “cord” about 1 cm (1/3 inch) thick and 3-4cm (2-3 inches) long. Now connect the ends of the dough to form a ring, making sure that the two ends are pressed together. Personally, I like to wrap the cord around my index finger or thumb to ensure that the taralli come out even in size. (This makes for a rather small tarallo but that’s fine). Continue until all the dough has been used up, laying the taralli on a baking sheet or other flat surface as you go. Once you’ve formed all your taralli, bring a pot of water to a simmer. Add the taralli—no more than 10-12 at a time depending on the size of your pot so as not to crowd them—and simmer them just until they rise to the surface of the water. Remove the taralli with a slotted spoon and let them drain for a few moments on a towel while you add the next batch of taralli. Place the blanched taralli on a baking sheet (no need to grease the sheet, as the dough itself has ample fat and should not stick). Place in a hot (200C/400F) oven for about 30 minutes, until the taralli have turned a light golden brown. Check them after about 20 minutes; if they are not as brown as you like them, raise the heat (or turn on your convection function, if you have one). Besides black pepper and fennel seeds, other possible flavors include red pepper flakes, onion, rosemary, sesame seeds and poppy seeds. I haven’t given exact measurements for these flavorings, but I like to be generous, using my eyes—make sure that the dough is speckled through and through, so that you get a bit of flavoring in each bite. The finely ground “OO” flour you can buy online or in better stocked Italian delis is especially nice for this dish as it produces a tender, friable tarallo, but if you don’t have access to it, don’t fret. Good old all purpose flour will do fine (as will, I suspect, pastry flour, but I have yet to experiment with it). After the rest, form the taralli by taking a walnut-sized piece of dough, rolling it out with the palm of your hand into a "cord" about 1 cm (1/3 inch) thick and 3-4cm (2-3 inches) long. Now connect the ends of the dough to form a ring, making sure that the two ends are pressed together. Personally, I like to wrap the cord around my index finger or thumb to ensure that the taralli come out even in size. (This makes for a rather small tarallo but that's fine). Continue until all the dough has been used up, laying the taralli on a baking sheet or other flat surface as you go. Once you've formed all your taralli, bring a pot of water to a simmer. Add the taralli—no more than 10-12 at a time depending on the size of your pot so as not to crowd them—and simmer them just until they rise to the surface of the water. Remove the taralli with a slotted spoon and let them drain for a few moments on a towel while you add the next batch of taralli. Have been looking for this recipie. Trying it tonight! If I don’t have white wine what liquid I could replace that with that is non-alcoholic ? I found that 1/4 cup of olive oil and 3/8 cup of wine only barley dampened the 00 flour. I got powder not dough. Is the recipe correct? Yes, the amount of flour was wrong. It should be 250g or 1/2 pound. Corrected the amount—thanks for point it out! Thanks so much for your comment, Rosemary! Love those family traditions. 🙂 Happy Easter to you and yours as well! I am really impressed that you made your own tarallucci, but then again I guess they are not as readily available to buy as they are here. They look beautiful, and delicious! They actually do sell taralli around here, some places, but I like my own much better. Plus I can decide what flavorings—and how much—I want to use! My family has made these forever. We have always used anise seed instead of the fennel. Also, we don’t make them round. They are wish bone shape and joined near the end of the rope. My nonna used to use a skeleton key to press them together. Nothing like taralli compares! They are so addicting. My grandparents came from Bisceglie on the coast near Bari. Hi Susan, My mom was raised in Bisceglie and her and my grandmother used to make the taralli in a wishbone shape too….although i can not remember what they used to press the ends together….maybe their thumb nail? I am planning on making Franks recipe in the upcoming months hoping it is like my moms. I made these yesterday! I halved the recipe, but I had to add a bit more wine as my dough was quite crumbly and wouldn’t come together. They came out great, made them with fennel seeds. Going to try a couple more batches, one with black pepper and one with chili flakes! Love your site and well researched recipes. Looking forward to your post on the Naples variety. Mine are not quite like the ones I have eaten in Naples. Love your site and all your well researched recipes. I make taralli and have tried my hand at the Naples version. Mine are not exactly like the ones I have eaten there so I am looking forward to your post on that version. Totally worth it, Paola. They’re quick and pretty easy to make. I’m sorry to say I’d never heard of these before – they look delightful and I want to ‘give them a try’!! Let us know how you like them, Cecile! Wow Frank, I never knew how these were made I just love them and always pick up a bag of the black pepper version when I’m at my favorite Italian store but yours look amazing and I might even be able to pull it off! I’m very sure you could with ease, Marie! And the great thing with making things yourself, as you know, is you can adjust the seasonings just the way you like them. Love these and have made them for my husband. He developed a taste for them in Italy. I like them just with the black pepper. They’re surprisingly easy to do. Thanks for the nudge – time to make them again. Black pepper is my favorite kind, too, Claudia! Well, I learned something new here, namely that these are boiled first. Thanks for the recipe Frank. I buy these at a local specialty store, but now I can make my own. And they’re a heck of a lot cheaper to make at home! i taralli sono una specialità che non manco mai di assaggiare quando vado in Puglia,semplici, col finocchietto , la cipolla o il peperoncino, è difficile scegliere uno o l’altro, meglio tutti ! Hai tutta la ragione del mondo, Chiara!